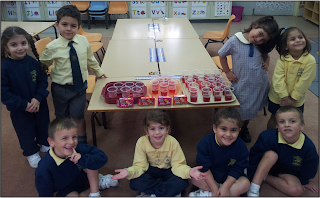 AGBU Alexander Primary School - Blog: JELLY TIME IN PREP/K CLASSROOM! On Thursday the Prep and Kindergarten class made jelly. First of all we wrote that jelly felt wobbly, it smelt sweet, it tasted yummy and that we love jelly! Then Mrs Terrey made the jelly with us. First we sprinkled the jelly crystals into a jug. Secondly, Mrs Terrey poured hot water into the jug to dissolve the crystals. Next we mixed the crystals with the water until we couldn’t see them anymore. We added some cold water and then poured them into cups and put them into the fridge. Today at recess, everyone was able to eat our delicious pink and red jelly.